The brand new BMW V12 LMR, fresh out of the box and starting on the pole, won the Superflo 12 Hours of Sebring. The team triumphed by just 9.29 seconds over one of the Dyson Racing Riley & Scott/Ford of Butch Leitzinger, Elliott Forbes-Robinson and James Weaver. More in BMW Motorsports. The new 3 Series coupe, dubbed the 328Ci and 323Ci, debuted at the Geneva auto show. The new 6 Series is taking shape at the BMW works. The 8 Series replacement will include an active suspension, possibly to compete with the new Mercedes CL class coupe. 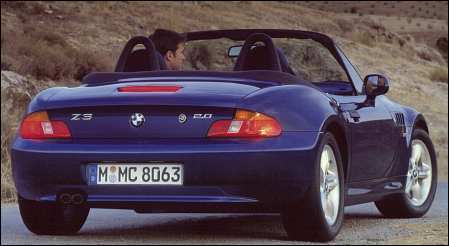 The car, due for release in 2001, will combine several current BMW design features, including side vents, into a sleek 2+2, as seen in this photograph. Meanwhile the 2 Series, or more likely, 2002, is also moving along. The photograph shown here reflects other artists' concepts that have circulated. Continuing the headlight treatment of the new 3 Series and X5, the car will have a range of engines from a 1.6 liter four to a 170 hp six. For an undisguised photograph of the new Compact, visit the Spy Shots page. 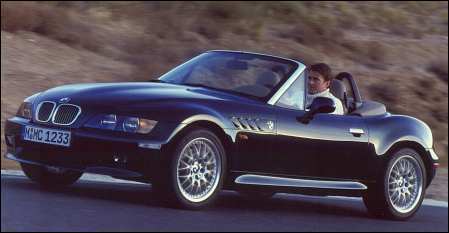 The 2000 Z3 roadster models (exclusive of the M roadster) are being improved with slight styling changes and equipment upgrades. The engine specifications are being updated to the new 3 Series standards, including double VANOS valvetrain. Styling changes include chrome rimmed headlights, tail lights that mimic the 3 Series and new curvaceous rear fenders. The 2000 model year cars will be available in April of this year. Once again the takeover rumor mill sees BMW targeted, this time by GM. GM officials deny the rumors. BMW, as a strong European luxury car maker, is an attractive takeover target. However, the Quandt family, which owns 42 percent of the company, would have to approve any merger. Brisk sales of the 3 Series sedans will not deter BMW from introducing the coupe version in April. However, the cabriolet will not reach market until mid-2000. Somewhat more interior and trunk room and a much more rigid structure are expected in the new model. The next M3 is expected late this year. In similar fashion to the M5, subtle will carry the day, with slightly more aggressive front and rear bumpers, larger intakes, dual exhaust, subtle sill extensions, and fat tires. Weight saving measures will include high strength steel trunk lid, hood, and doors as well as extensive use of aluminum in the suspension. Transmissions will likely be 6 speeders, one with semi-automatic sequential control. Possibilites of M3 sport wagon and cabriolet versions haven't been ruled out. Finally, a new Compact (ti) will be introduced in 2001. Based on the coupe with a hatchback, the car will have its own distictive sheet metal. The interior will be based on the sedan, with unique trim options. With stricter emissions and fuel economy standards in the future, power dense engines and lightweight structures will become more important. BMW insiders feel that the new 2002 will be a perfect spearhead to for the new technology. Of course the biggest hurdle will be price. BMW insiders are confident the 02 will see the light of day in late 2001. The Automobile magazine is reporting the development of two small sport utility vehicles based on the new E46 3 Series chassis. Artists concepts show the X3 to be a small version of the just released X5 and the K2, a small pick-up reminiscent of the Chevrolet El Camino and Ford Ranchero. BMW will increase the dispacement of the 2.8 liter 6 cylinder engine to 3.0 liters for the 2000 model year this will make the upscale models have a more discernable power increase from the 2.5 liter powered X23 badged models. BMW AG's web site is previewing the 3 Series coupe. This site is designed to bring you the latest breaking news on BMW's. Here you will find rumors, spy photos, artists concepts, and the latest official releases from BMW AG and BMW North America. The BMW of the Week section contains a photograph of, oddly enough, a BMW. This section, in keeping with its name, will be updated weekly. The BMW then section will feature a model or series of models from BMW's past. From the triumphant 507, to the common Isetta, BMW's varied offerings form the wide spectrum of its colorful history. This section has recently been updated with a short story about John Surtees' 507. Visit the the special M Roadster gallery for pictures of the Motorsport powered M Roadster and M Coupe. Visit the BMW motorsports page to see BMW racing news, including the success of BMW in the Rolex 24-Hours at Daytona and the final BMW results from the final season of the North American Touring Car Championship. Due to a lack of manufacturers backing, the series has been cancelled for 1998. They are seeking support to bring back the series in 1999. Visit the North American Touring Car Championship site to register your support for the	series.